Sometimes there is a reluctance to begin home composting because of concern about odors. We want to reassure you that in a well-managed compost setup, odors are easily avoided and, should they develop, can be quickly and easily resolved. Here's how. Aerobic decomposition process: Decomposition that occurs in the presence of oxygen. Anaerobic decomposition process: Decomposition that occurs in low or absent oxygen environments. Compaction: Refers to the sticking together of moist organic materials from manual pressure, the force of gravity, the weight of the organics, or a combination of all three. Compaction of moist organic material reduces air/oxygen presence in the blend, leading to putrefaction and unpleasant odors. Leachate: A liquid which comes from the downward percolation of liquid developing in a composting operation. 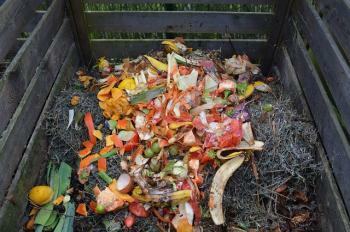 Organic material: The greens and browns which are added to composting setup. That is, anything which was once alive containing carbon and often nitrogen, from both plant and animal sources. Putrefaction: Decomposition of organic material in a low oxygen environment producing acids and alcohols and resulting in foul odors. Vegetarian animal manures: Manures from animals that eat only plants. Organic material has already begun putrefaction before it is added to the bin. Compost is in an anaerobic (low oxygen) condition because moist organic material is compacted. Leachate from a bokashi bucket or worm bin is allowed to build up without adequate exposure to air. Worm bins are allowed to build up deep castings at the bottom or more moist organic material is added to the top of bedding than worms can handle in a time period. Fresh vegetarian animal manures have a unique, sometimes odiferous, scent because they are produced in an animal's colon which is an anaerobic environment. Urine included in manures may produce a pungent ammonia-like odor. 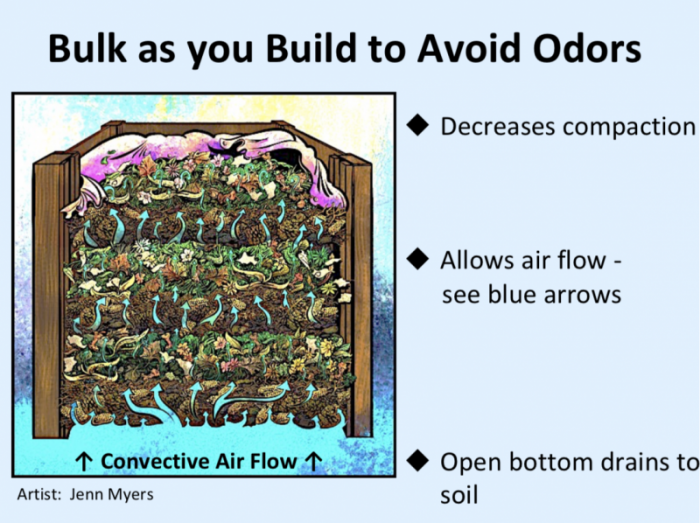 Expose fresh manures to air for at least 48 hours to dissipate odors before incorporating into your composting setup. Use only vegetarian animal manures. Overly moist organic materials will stick together leading to compaction in compost piles. This compaction of wet organic material decreases good aeration and leads to anaerobic microorganisms taking over the decomposition process. Anaerobic microorganisms produce unpleasant-smelling gases, so compaction of moist organics should be avoided. About 50% moisture is recommended during the entire decomposition process. This is comparable to the residual moisture in freshly brewed coffee grounds. All the particles are saturated but not dripping wet. Excess moisture may be reduced by the addition of dry ingredients, by fluffing the ingredients, by exposing ingredients to air, and by open-bottom gravity drainage. Avoid compression of wet organic material by manual pressure, weight, or gravity in any home composting operation. Coarse bulking material added as the composting setup is built up will help decrease compaction of wet organic material, thus avoiding odors. Bulk as you build piles, bins, and tumblers. Finger-size sticks, wood shavings, pine cones, and pine needles make good bulking materials. See bulking and air-flow graphic at the bottom of this page and see Composting in the Desert, page 6. Avoid standing liquid in any backyard aerobic composting operation. Composting setups must provide for gravity drainage of excess liquid to the soil or a collection container. Leachate from worm bins or bokashi buckets usually drains into enclosed reservoirs below the bin or bucket. This leachate will become anaerobic when deprived of oxygen. At that point it will begin to smell foul. Leachate-holding containers should be emptied regularly and frequently, so that the liquid does not become anaerobic. Compaction of organic material may occur in a worm bin when castings become too deep in the bin and eliminate good airflow. Compacted worm castings at the bottom of a worm bin may be fluffed and aerated. Wood shavings or small twigs may be used for this purpose. Avoid piling up organics on top of worm bedding. Harvest worm castings regularly. Ideally organic material added to a worm bin should be consumed before another addition is made, thus avoiding the build-up of organic materials. Some organic material will have already begun putrefaction before being added to compost, for example, left-over food in a kitchen holding container which is very moist and compacted. The odor will dissipate if the materials are fluffed, mixed with dry organics such as shredded brown leaves or shredded paper, and then exposed to air until the odor decreases. Empty kitchen counter holding-containers regularly and frequently. Contact us with your questions: compost-questions@nmcomposters.org.